Perfect garden furniture can enhance the beauty of a well-maintained garden. However, you need to be very careful when selecting garden furniture, so that you can maximize your relaxation and minimize the need for cleaning and maintenance. Comfort, durability and style are some of the key elements you need to think about when shopping for the perfect garden furniture. 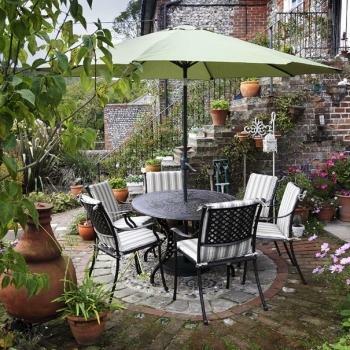 Here are a few tips from Lazy Susan when it comes to selecting the right garden furniture. First of all you need to be meticulous when selecting garden furniture, just like you would when investing in furniture for the inside of your home. Its also vital that the style you choose is well fitted with your existing or planned garden decor as nobody wants to see modern furniture in a traditional country garden. You want to create a comfortable dining space in your garden, but at the same time you need to see that it does not overcrowd your garden or patio area. Once you start searching for garden furniture you will come across a myriad of different styles and materials on the market. Ensure that the material and style of garden furniture is such that it can sustain the harsh elements of a cold and wet Autumn/Winter. After many years of trying, in vain I may add, to maintain various timber garden furniture sets, it became clear that one of the best solutions was in fact to invest in some quality metal garden furniture, in particular cast aluminum garden furniture. Cast Aluminum Garden furniture has so many benefits over timber, and even cast iron for that matter. Aluminum garden furniture will not rot and will not rust, it is maintenance free and will not need replacing every 3/5 years and it is designed to be left outside all year. Not a material that first springs to mind, but take a look at the aluminum furniture out there and I think you'll be surprised. Next important point is comfort. A much overlooked aspect of outdoor furniture. You can select from a varied range of cushioned seats, love seats, rocking and swivel chairs, side tables or lounges that all match your desired comfort levels. If you're going to buy on the internet, just make sure you read recommendations from those who've purchased that specific product in the past, or even better, try before you buy. After all, you want to know its as comfortable as the manufacturer claims! Be creative and add your own personal touch when placing garden furniture. And before deciding any style, go through all the available styles and designs of garden furniture. It can be overwhelming when trying to figure out what furniture to buy for your garden. With the arrival of spring, garden centres are packed with furniture of all types. Patio sets, benches, statues, fountains, barbecues, the list is endless. The process may seem daunting at first, but it doesn't have to be stressful or overwhelming. Do your research online and enjoy your garden in comfort.